The geography of Tibet consists of the high mountains, lakes and rivers lying between Central, East and South Asia. Tibet is often called "the roof of the world," comprising table-lands averaging over 16,200 ft. above the sea with peaks at 19,600 to 24,500 ft. Including Mount Everest, on the border with Nepal. In addition to other features additional highlight of this tour is a stop-over at Tibet-side of Mt. Everest Base-camp without having to trek for three to four days on foot from Nepal side. As it is a high altitude tour it's important that one should be physically fit without any upper respiratory or cardiac problems. For normal healthy person, age is no bar however we recommend that you check with your doctor about your driving trip to Mt. Everest Base-camp. All precautions are taken by us to make smooth trip for our guests including availability of portable oxygen tank, just in-case. So get ready for an exciting journey of a lifetime. Welcome aboard your flight to Kathmandu, Nepal. Arrive Kathmandu, transfer to Hotel Del Annapurna. Breakfast at the hotel, morning sightseeing tour of Kathmandu city, also called 'Kantipur' or city of Glory, visiting 'KUMARI' the LIVING GODDESS, Kasthamandap, the Big Bell, Kal Bhairab etc. 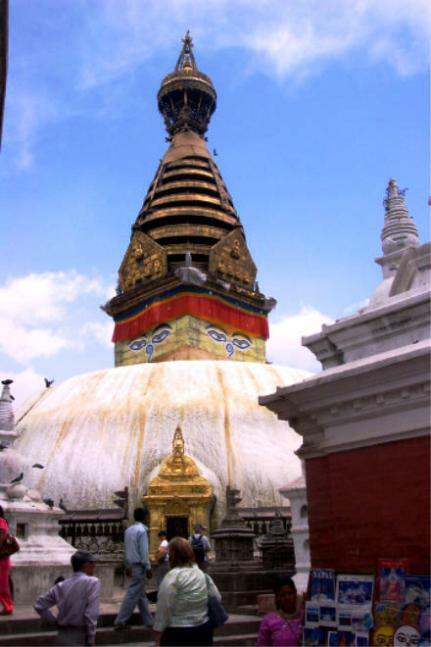 We'll also visit Swayambunath Temple, a Buddhist Stupa, and set high on a hill with a commanding view of the Kathmandu valley. This afternoon visit Patan, the city of fine arts, Durbar square, Krishna Mandir, Mahavihar-Golden Temple of Lord Buddha, built in the 12th century. We'll also visit the Tibetan Center. This morning visit the ancient city of Bhaktapur, or city of Devotees, also known as Bhadgaon, visiting Durbar square, Lion gate, the five storied Nyatopolo Temple, the tallest of its kind in Nepal, and the palace of 55 windows. The film, LITTLE BUDDHA was shot here, among other places in Nepal. Afternoon free. Overnight at hotel. Morning transfer to the airport for our flight to Tibet. This spectacular flight, on an Air China Boeing 757, takes us right across the main Himalayan range and provides with magnificent mountain views. After landing at Gonggar Airport and meeting our Tibetan guide, drive by Land-cruiser jeep to Lhasa where we will check in to the Hotel. It's advisable to rest and take it easy for the remainder of the day due to Lhasa's altitude. Lhasa Hotel. Today will be spent visiting several of Lhasa's many monasteries in the company of a guide-interpreter. One of these is the Sera Monastery, one of the best preserved monasteries in Tibet. Within its white-washed walls and golden roofs, several hundred monks live and study. After lunch we'll visit the Norbulingka, the summer palace of the Dalai Lama, as well as the Jokhang Temple. This temple is the most sacred shrine in Tibet and there is always a procession of devout Tibetans through the complex. Surrounding the Jokhang is the Barkor - a maze of narrow cobbled streets which is the central market of Lhasa. This morning we'll visit the Potala Palace which dominates the city of Lhasa. A spectacular building, it contains the private quarters of the Dalai Lama as well as numerous grand state rooms and many important chapels. There has been a palace on this site since the 5th or 6th century, but the present palace was constructed in the 17th century. A visit to the Drepung Monastery this afternoon will complete a truly awe-inspiring day. Founded in the 14th century, this monastery was once the largest in the world. With a population of around 10,000 monks. These days that figure is down to several hundred, but there is still much here of interest as it was left relatively unscathed during the Cultural Revolution. Travelling by Land-cruiser along the Friendship Highway well cross the Khamba La, affording us stunning views across the waters of Yamdrok-tso (lake) to the snowy summit of Nazin Kang SA. We continue westwards over another high pass, the Karo La, where we are treated to the spectacular sight of a huge glacier tumbling down to within a few hundred meters of the road. After passing through beautiful valleys and colorful Tibetan villages we arrive in the town of Gyantse. Our overnight accommodation is at the Gyantse Hotel. Before leaving Gyantse we have time this morning to visit the Gyantse Dzong and Gyantse Kumbum. The Dzong is a fort dating from the 14th century from which there are amazing views of both Gyantse itself and the surrounding Nyang Chu Valley. The Kumbum is a large gold-domed stupa and its many small chapels house an impressive array of Tibetan Buddhist murals. We then continue on to Shigatse, a short drive of only 90kms, arriving in time for lunch. Shigatse is the second largest city in Tibet and after exploring the local market we will make a detailed visit to the Tashilhunpo Monastery. This monastery is one of the largest functioning monasteries in Tibet and there is much to explore within its high surrounding walls. Overnight at the Shigatse hotel. Today we'll continue along the Friendship Highway, marveling once more at the barren yet spectacular landscape of Tibet. Beyond the small town of Lhotse we cross the highest pass on our journey, the Gyamtso La. From here we'll descend to the plains, passing lonely monasteries and the camps of nomadic herders, en-route to Shegar. Overnight at the Everest hotel. Shortly after leaving Shegar, we'll turn off the Friendship Highway and head south over the Pang La, towards the main Himalayan range. The view from the top is incredible with uninterrupted views stretching from Makalu to Shishapangma. Below the pass, Everest initially is hidden from view, but as we turn the corner into the Rongbuk Valley it reappears, more impressive than ever. Overnight at the Guest House. This morning we have the opportunity to explore Everest Base Camp. The base camp itself is dry and barren, but the views of Everest more than compensate for this. It is a truly awe-inspiring place with the sheer north face of the highest mountain in the world towering above us. After lunch, we return to the Friendship Highway and drive to Tingri. Overnight at the Lodge. Leaving Tingri, we cross another two high passes, the Lalung La, and the Shung La. Once more we are rewarded with magnificent views of the surrounding peaks of Shishapangma, Cho Oyu, Menlungtse and Gauri Shankar. Now we begin our descent from the arid Tibetan Plateau to Zhangmu on the Nepalese border. After Tibet, it appears an incredibly lush and green town and we'll stay overnight at the Zhangmu Friendship Hotel. From Zhangmu we drive a few kilometers to the Friendship Bridge which spans the Bhote Kosi River and marks the Chinese - Nepalese border. We say good-bye to our Tibetan guide and driver and walk to Nepalese Immigration Control in Kodari where we will be met by our Nepalese staff. After completing the re-entry formalities we continue the drive to Kathmandu. Hotel Royal Singhi/Annapurna. After breakfast fly to Delhi, airport meet and drive to Agra 202KM distance aprox.4hours. Arrive Agra and check-in to hotel. Evening free to relax with an optional stage show about the Mogul Raj in India, depicting the history of the Taj Mahal. Early sunrise visit to Taj Mahal, the most extravagant monument ever built for love. On the death of his beloved wife Mumtaz Mahal, Mogul Emperor Shah Jehan built her this memorial over which 20,000 men labored for 22 years to create a masterpiece in white marble inlaid with semi-precious. After breakfast check out from Hotel. Agra Fort where Shah Jehan spent the last years of his life, imprisoned by his son Aurangzeb. The most impressive part of the Fort are the Dewan-e-Am, Hall of Public Audience where the Emperor met officials and listened to petitioners, and the Dewan-e-Khas Hall of Private Audience where he received foreign dignitaries. The Peacock throne (now in Iran) was in this fort, before being moved to Delhi by Emperor Aurangzeb. In evening visit stones; the art is called pietra dura. 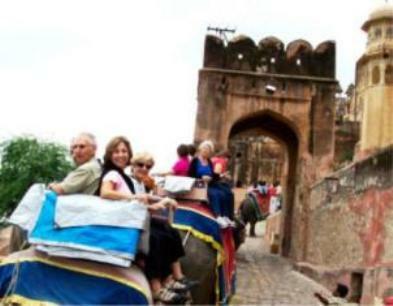 After exploring the sites of Agra, drive to Delhi. Arrive Delhi and proceed and check in to hotel. Evening at leisure. After breakfast at the hotel, extensive city sightseeing tour of Old and New Delhi, that includes drive past by Rashtrapati Bhavan (the Presidential Palace) and the Secretariat buildings - the center of Government activity, down the impressive Raj path (the main avenue), to the World War I memorial arch, India Gate, the High Court Building and the Old Fort. Visit Humayun's Tomb built in 1565 AD by his grieving widow Haji Begum, and the Qutub Minar, 72 meters high and the ruins of Quwat-ul-Eslam (Light of Islam) Mosque. Old Delhi, visit Raj Ghat, where Mahatma Gandhi the Father of the nation was cremated in 1948. 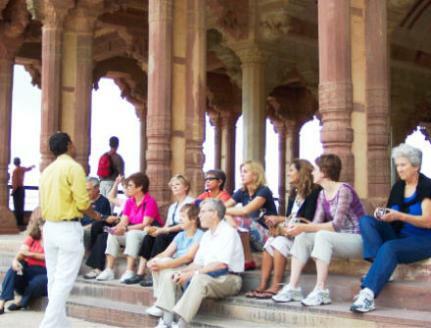 Drive by Red Fort, built of red sandstone dating from the very peak of the Mughal power. Opposite the fort are the black and white onion dome and minarets of the Jama Masjid, the most elegant mosque in India. Evening prep for homeward bound departure. Transfer to airport.